"Why let kids dangle boiled eggs over fire? 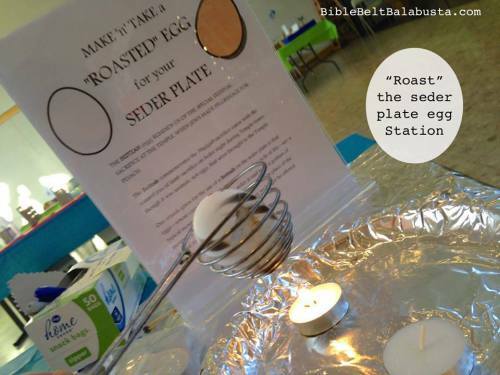 To candle-roast an egg is a quick, hands-on connection to what the seder plate egg symbolizes. It’s weird, it’s memorable and it is a kid magnet. Signage helps set the scene and draw participants, but be sure you explain the Why of the roasted egg. The beitzah is a universal symbol of spring and birth, but also a particular symbol of the Temple: a sign of mourning for its destruction (eggs are classic shiva food), and most importantly, a stand-in for the roasted chagigah sacrifice back when Jews made pilgrimage for Pesach. At the program, kids take their DIY roasted egg home to use for seder, but not until they’ve practiced with it."